As legal marketers, we are all pulled in a million directions, and deciphering which law firm rankings and directories are worth your valuable time and the firm’s resources is a strain. After all, no one wants to invest time and money into a listing that does not help the law firm. In the past few months, I’ve had a number of requests from clients regarding the value of certain legal directories and rankings. As I explain, first and foremost you must assess every law firm ranking opportunity to make sure it fits into the firm’s overall goals. Whether your objective is to increase awareness, highlight successes or entice new employees, rankings must fit into the law firm’s marketing and business development plan to be worth the time and effort. But how do you know which ones are worth the time and effort? There are several factors that should raise a red flag. Now that doesn’t mean the law firm ranking or legal directory is not legit, but it means you should spend some time investigating the publication further. Pay to play – Is it pay to play? Does the publication charge to be included in the legal directory or to submit? If so, then you should carefully weigh the cost to participate versus the benefit. Check to see who will receive the publication and how the readers access the data. If it’s online, what is the click-through rate and who is accessing the information? It is important to make sure you will be reaching your target audience. No nomination form – Did you or someone at your law firm fill out a submission form? How did the publication get your name? And what methodology is it using to select the winners? Very few publications do not ask for submissions for their law firm rankings. Additionally, if the publication contacted you, there is a good chance it is fishing. Fit – To reiterate, does the ranking meet your law firm’s goals for 2014? At this point, your legal marketing plans for 2014 have been set, and you can clearly assess if this listing is a part of that plan. Also, who will receive the directory? No matter what the goals are, make sure you are reaching your target audience. Everyone wins – Is it a directory where everyone who responds is listed, and sometimes those who don’t respond are included? This raises a red flag. There are a few well-researched and respected publications that rank law firms without their involvement. It is very important to research the methodology for inclusion. Make sure the researchers are well versed in the legal profession and find out what criteria they are analyzing. Sometimes researchers rely heavily on industry experts. Being included in a publication like this adds credibility to your law firm. However, there are many directories that do not thoroughly research the firm’s body of work – watch out for these listings. Navigating the thousands of law firm rankings and directories available to firms and attorneys is daunting. 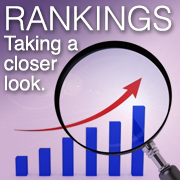 Determining the value of those rankings and listings requires necessary research. Want to know which law firm rankings are the best fit for your firm? Contact me at sholmes@jaffepr.com.